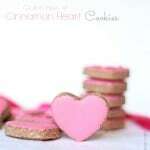 Gluten free Almond Cinnamon Heart Cookies that are perfect for Valentine’s Day. These cookies are irresistibly chewy in the center with crisp edges and a crunchy meringue top! Can someone pinch me, please? Christmas season really is behind us already isn’t it? There are just about a couple more weeks until Valentine’s Day!! This must be a sign of me getting old(er). I remember a few years back, when my husband and I were still dating (long-distance), the time between Christmas and Valentine’s Day seemed to stretch out forever. You see, Konrad usually came to visit me in Kelowna over the Christmas holidays and I went to visit him the week of Valentine’s Day because it always fell during reading break in university. I almost feel nostalgic looking back, but I wouldn’t wish these years back – being apart from the person with whom you are madly in love is never fun. This winter, I kind of missed out on a lot of Christmassy stuff. I was too busy running to the nearest bathroom with morning sickness that Christmas baking didn’t even happen. I wasn’t going to let the same happen for Valentine’s Day. Cookie baking is on and in full force! These cookies are derived from the German Christmas cookies called Zimtsterne. It literally means ‘cinnamon stars‘. So you can guess that I am deviating from tradition by making them into heart shapes for Valentine’s Day. Woahh… I feel rebellious! The traditional recipe is naturally gluten free as it uses only almond flour with a healthy punch of cinnamon. Wham! And it is also dairy-free since there is no butter or any other added fat. Bonus points. These cookies have a wonderfully chewy texture in the center, with crisp edges and a beautiful meringue crunch on top. Of course, the star-shaped Christmas cookies don’t usually have pink tops. Coloring the meringue pink is just another way I am straying from the norm and rebelling to make these cookies fit for Valentine’s Day. 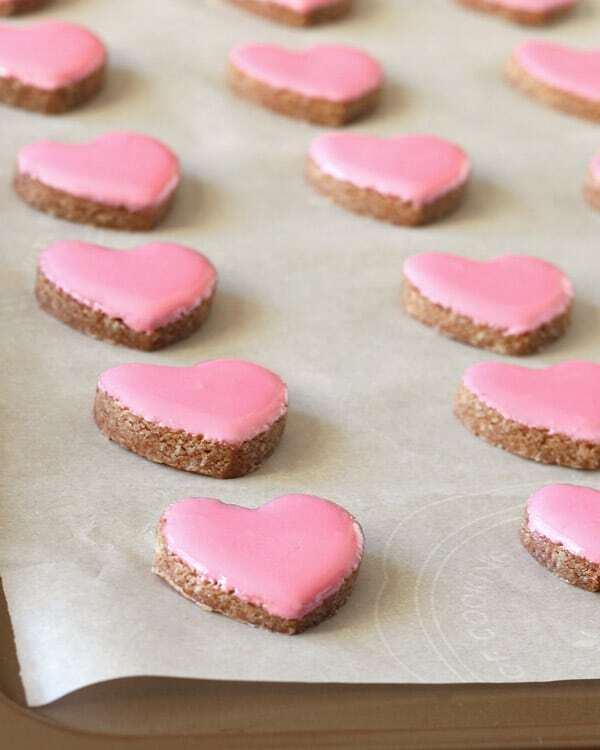 I even sprinkled some edible heart glitter on a few of the cookies. 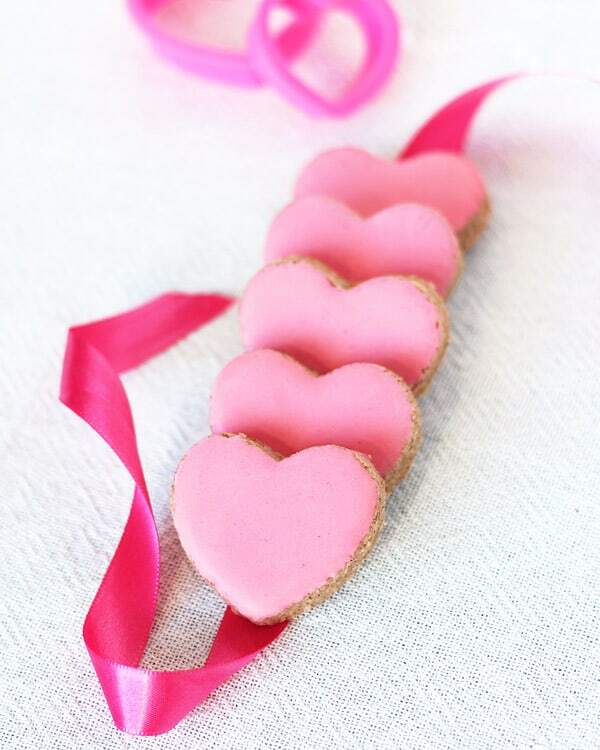 Edible… Heart… Lol. Don’t get the wrong idea! These are confectionary treats! I remember making Zimtsterne as a child in Germany, and I must admit that they were slightly difficult to make due to the dough being so sticky. To my surprise, I didn’t have any of these issues with this recipe that I found on the Seaside Baker’s blog. I think the key is to use only as much of the meringue mixture as is needed to hold the dough together. By the way – I should put a disclaimer in right now. These cookies are by no means fast to make. First, the rolled dough has to be chilled before cutting out shapes. Then, the cut cookies are brushed with or dipped in the meringue (I found dipping to be easier and cleaner). Now the biggest bummer: the cut-and-dipped cookies have to dry anywhere from 3 hours to overnight before you can bake them. 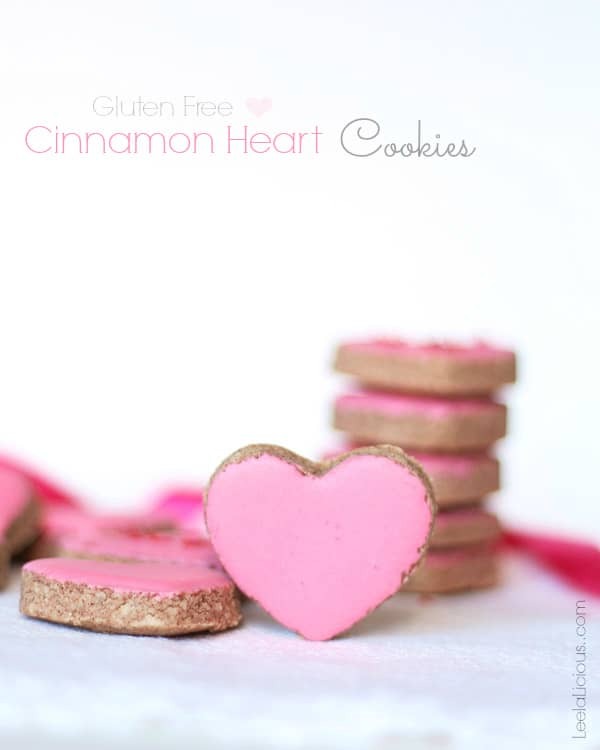 Please, don’t let that keep you from making these gluten free Almond Cinnamon Heart Cookies. They are entirely and totally worth it!! Enjoy your time with your loved ones this Valentine’s Day! I know I will! 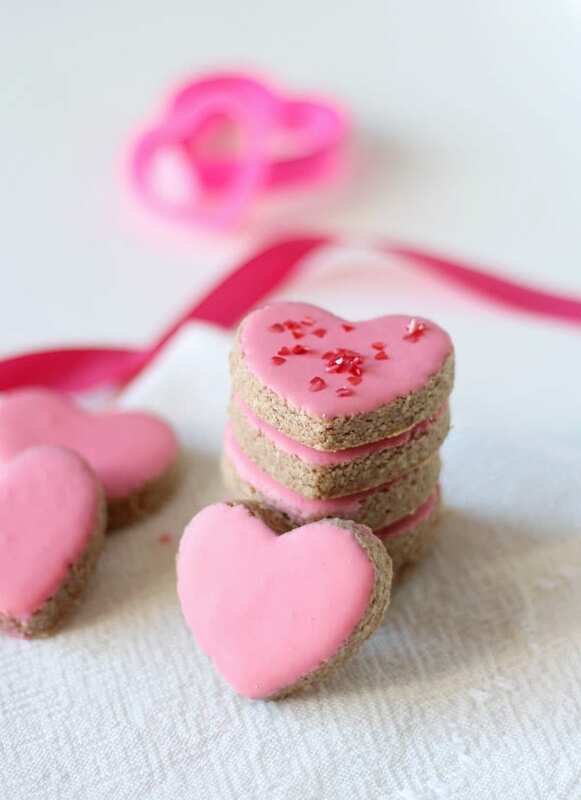 Gluten free Almond Cinnamon Heart Cookies that are perfect for Valentine's Day. These cookies are irresistibly chewy in the center with crisp edges and a crunchy meringue top! Beat the egg white with an electric mixer until stiff. Slowly add the powdered sugar on low speed until incorporated and meringue is glossy. Set 3/4 of the meringue aside and cover. Fold the almond flour, cinnamon and almond extract into remaining meringue. If the mixture seems too dry, add more meringue one tablespoon at a time until a smooth dough ball forms. Roll the dough between 2 pieces of parchment paper about 1/4 - 1/2 inch thick. Refrigerate dough disk for 1 hour. 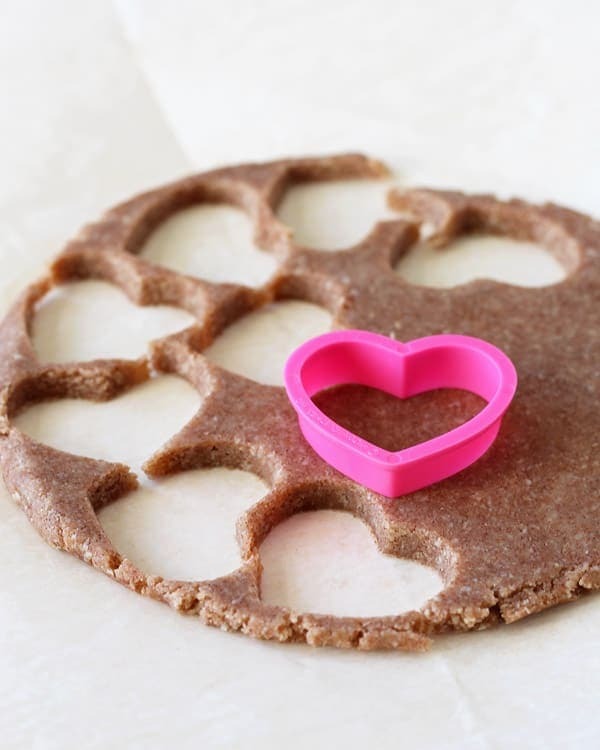 Cut out small heart (or other) shapes and place on a parchment lined baking sheet. Clean cookie cutter if it starts to stick. Colour the remaining meringue with a little red or pink food coloring. Either brush the meringue over the cookies or dip the cookies into the meringue and tap off excess. Dry cookies at room temperature from 3 hours to overnight. Preheat oven to 340 F and bake cookies for 7 minutes. You changed your site! I love it! Love these cookies and love the new design! You rebel, you!! 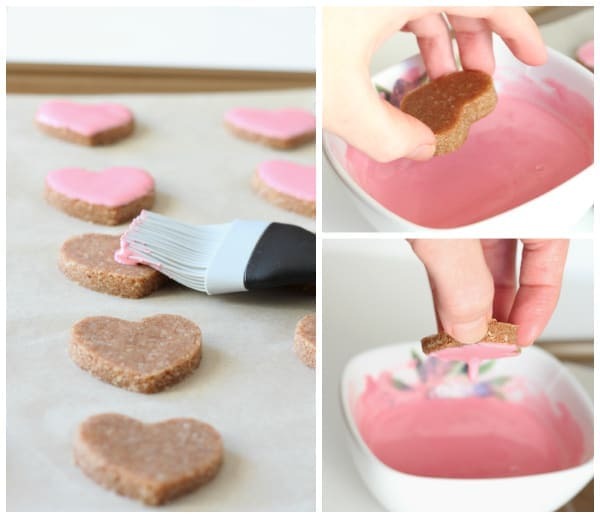 These are soooo very adorable and I am intrigued by the recipe and the process. We did the long distance thing briefly, as well – no fun. I can’t get over how adorable these cookies are! That’s totally worth all the resting time. Pinning!